Speed Up Productivity On the Job! This perfect balloon cutter is a great time saver for decorators to quickly cut ribbons and arch line. 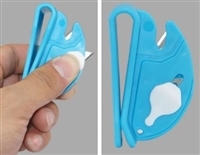 Stop looking for your cutter because it clips on to you or your balloon bag. It has a small blade on the side for popping balloons and opening boxes and balloon bags. The small side blade retracts automatically to stay out of the way! Colors may vary from the picture. This cutter is half the price of other cutters.